The Menu Composer allows you to quickly build a custom store navigation. You can combine categories, information, system pages, external links, or custom HTML dropdown. You can also list all categories and brands. Custom label Set a custom menu label. Accent label Set an accent label for the menu item. Accent color Change the accent color of the menu item. Accent background Change the accent background color of the menu item. Additional class Insert extra class(es) for additional styling. Separate multiple classes with space. Information, system pages and custom links can have submenus up to 2 levels deep. Megamenu A megamenu will span up to the maximum website width. Category max depth Define how many subcategory levels a category can have. E.g. if category max depth is set to 2, you can have subcategories and sub subcategories. Category columns Define the number of 2nd level categories per row. Category thumbnail Shows each 2nd level category’s thumbnail. If no thumbnail is set, the default OpenCart “no image” image is shown. Subcategory hover thumbnail Display the corresponding image when rolling over a 3rd level category. The image will be shown at the place of the 2nd level category’s thumbnail. Thumb size Size of subcategories thumbnail. 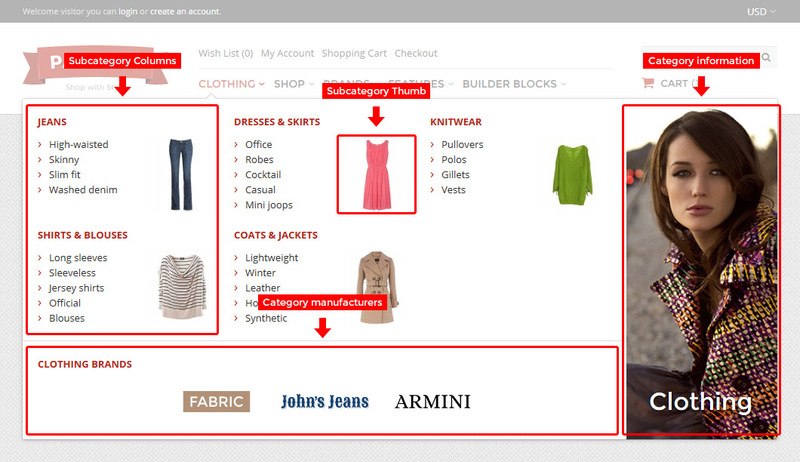 Show brands Show all or selected brands under subcategories, or in a separate column. Show title Show category title in a separate column. Category thumbnail Show category thumbnail in a separate column. Description Set category description in a separate column. Vertical align Vertical align of category title, thumbnail and description. Custom background Set a custom background image for the category information (title, thumbnail, description) column. Category submenus are auto generated and cannot be assigned manually.